I was born in 1965. 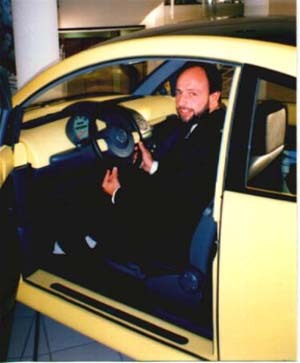 At this very year the Fridolin -Type 147 and the VW 1600 TL were introduced. Also on September 15th of this year the 10th million after War Volkswagen was produced. 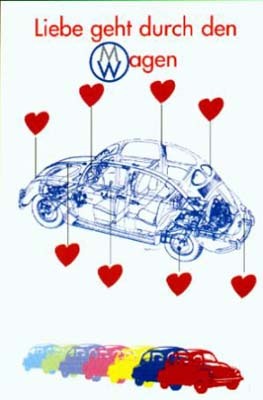 My former girlfriend, she had a 1302 Cabriolet, introduced me to the VW history. I own a LLoyd Alexander (Automobile made by the extinct company Borgward), build in 1958. In 1988 I drove this car to Wolfsburg where the son of Carl F. Borgward, Klaus, that works at Volkswagen, invited us for a special factory tour. That was the point in which I became to be a VW historian. John sent me an e-mail some time ago introducing himself. Since then he is sending material for the quest and keeping me informed about various subjects related to the VW Scene. Recently he finished the issue of historical post cards. I selected the example on the left, because it was made by some time ago him and shows his artistical and well humored style. The sentence of this postcard is a joke with a well-known sentence: "The man is caught by the stomach". He made a joke with the word Magen (stomach) transforming it in to Wagen (car). I thank John for his faithful participation in the QUEST.